A DigiMemory 「デジメモリ Dejimemori」 (Dub: DigiCards) is an item which resembles a Memory Stick that appears in Digimon Xros Wars. The data of "legendary Digimon" are stored on them and can be used with the Digimon Xros Loader to summon those Digimon. They depict an official Bandai image of a Digimon along with their name, the character for "Technique" 「技 Waza」 written inside a green hexagon, and one of their Special Moves displayed at the bottom. They are the stored data of the legendary guardian knights of the Digital World who fought against Bagramon in the past with the attempt to prevent him from ruling both the Real and Digital World. When summoning legendary Digimon, the user inserts a DigiMemory into their Xros Loader and shouts out the name of the technique displayed on the DigiMemory followed by "Activate!" 「発動！ Hatsudou!」. 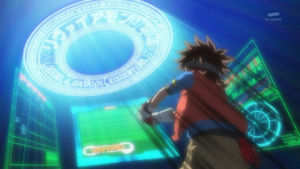 Digital screens appear either side of the user, containing information such as Special Move descriptions, in addition to a rotating magic circle that appears above the user. The middle circle is inscribed with a random sequence of Greek letters (ξοακωοξλξωκθοριξκααεϕχιοθπ,εϕχιοθπ,ξκλ), together with the outlines of the yellow and silver Pickmon at opposite ends and the Digimon's name written in katakana. After all of this pursues, a hologram of the Digimon stored on the DigiMemory then appears. Once used, the image of the Digimon on the DigiMemory becomes a silhouette temporarily. In Sand Zone, Taiki chose Guilmon's DigiMemory and activated its Rock 'n' Roll Breaker attack to drill a hole in a rock wall, allowing him and Baalmon to pass. While in a protective barrier, Examon and War Greymon explain to Taiki and his friends that long ago, Bagramon became aware of the existence of the Real World and attempted to rule it along with the Digital World. In order to stop this, Omegamon and the others fought against him, but as the growth of human digital technology was also involved, it caused the two worlds to draw closer together. The energy produced from this caused the Core to become unstable, and the Digital World became scattered, forming the Code Crown fragments as a consequence. The resulting shock wave caused the DigiMemories to separate, with Examon and War Greymon being hurled into the space between dimensions. 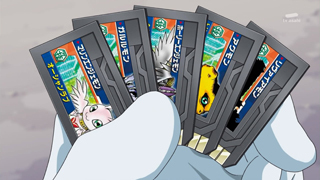 DigiMemory memory cards, based on the ones that appear in Digimon Xros Wars, can be used to summon legendary Digimon. They usually come packaged with merchandise, in particular the models from the Digimon Xros Wars Sofubi Digital Monster Series, which include DigiMemories based on the Digimon of a specific figure, and the Digimon Xros Figure Series, which include DigiMemories that appear in the series. They also have AR codes on the back of them that can be scanned by the Digimon X Arena. Patamon Air Gust Digimon Catch Ganbare Monitamon! Strangely, although a DORUmon DigiMemory is in the anime, it was never used even after the DigiMemory Digimon were revived. This page was last modified on 6 September 2017, at 19:06.